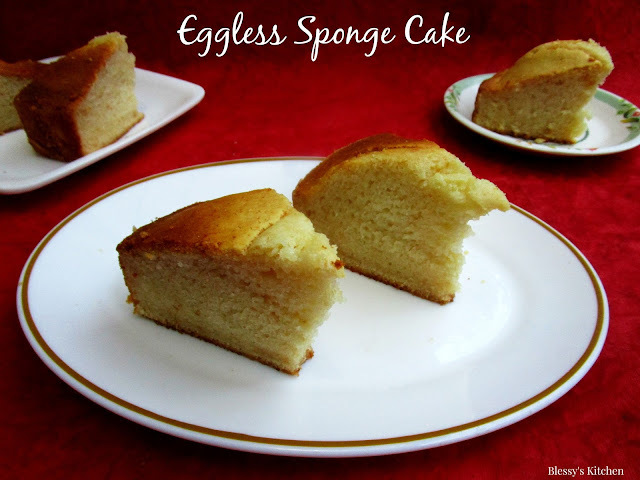 So, today morning I posted my Vanilla Sponge Cake in various Fb groups. 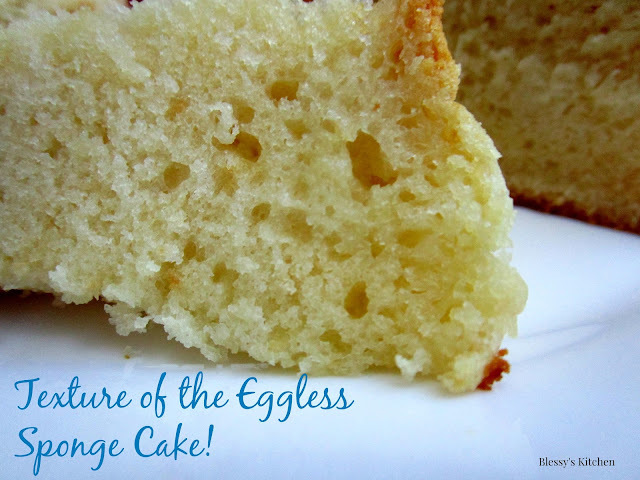 A bunch of facebookers had asked me to share an Eggless Version of the Sponge Cake. So this post is the result. I started arranging my ingredients and I had a power cut. Huh! I did'nt stop and I continued, thinking I could bake it in the cooker. As I was mixing my batter, Tadaaa! Power was back! So I baked in the 7" round tin and I saw kinda volcanic eruption happening in the middle while baking. Hmmm, My tin was small, I should have used a wider or bigger ones. This was my mistake and thats why I could'nt photograph the whole cake. I did'nt want to post it and then I thought I don't want my fellow veggie friends to hold on wait. This is why I'm posting it. Photographs may not be clear or appealing but the recipe matters right? Recipe is blameless. I baked this cake a decade ago during my schooling. I remember my Peddamma having this cake. She loved it, she encouraged me to cook more and bake more. This might be her first Homemade Eggless Cake. Me as a school girl, one of my hobby was to bake. My mom gave this recipe and I followed it. Now, after a decade when my veggie pals wanted a good eggless sponge I was thinking about this cake. Me and mom, we both forgot the recipe, I started recollecting it, I started experimenting and finally I succeeded. 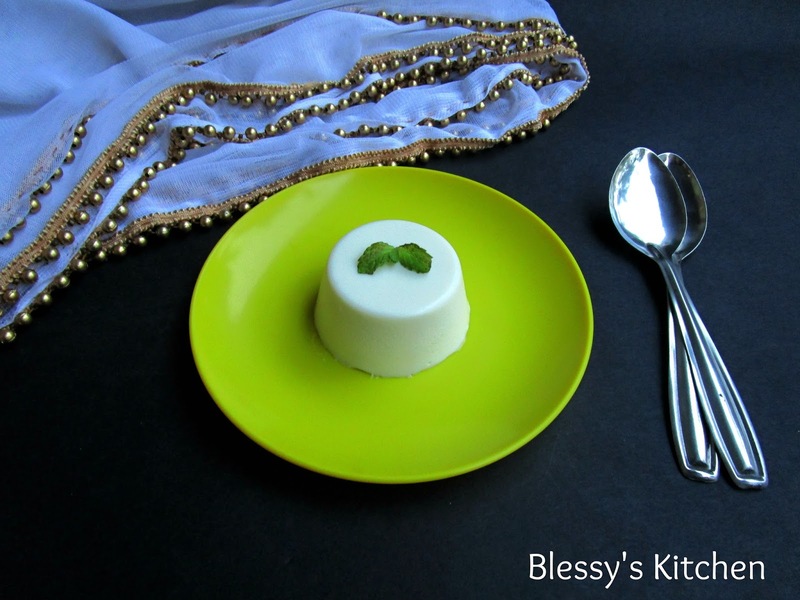 This is not the exact recipe which I made a decade ago, I altered the recipe as I experimented. Yes, I had failed cakes and I learnt from it. So don't be afraid about the mistakes, they will help you gain even more knowledge. 1. First add the vinegar to the milk. 2. In an other bowl,mix all the dry ingredients. 4. Mix gently with the light hands until everything is well combined. 5. Pour it into the greased cake tin (I recommend to line it with the parchment paper) and bake it in the preheated oven until done. (preheat 150 degrees C, bake for 10 minutes, next reduce to 100 degrees C and bake for another 30 minutes). I always place my food on the top rack in my New Morphy Richards 28 Ltrs OTG. I see others baking in the middle rack, may be because thermostat/ temperature sensors differs. 6. Each oven differs, so keep an eye while you bake! To store the cake, let it get cooled completely and store in an air tight container. Also check out Eggless Chocolate Cake and Nita Mehta's Eggless Vanilla Cake. 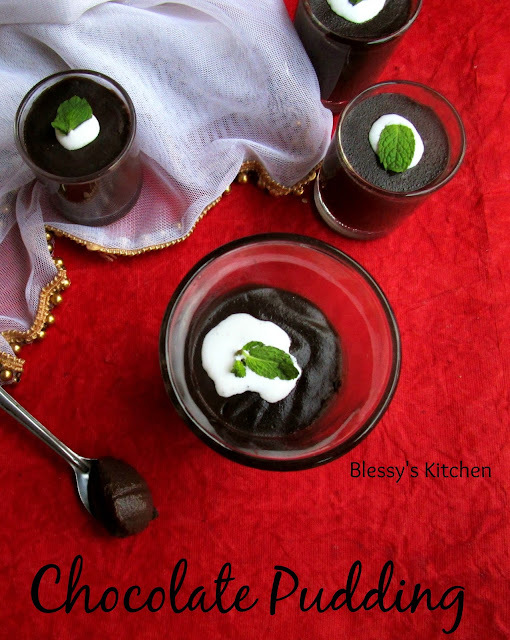 This classic chocolate pudding is perfect for party time. When it comes to the Puddings, they are of two kinds. It could be either sweet or savoury. 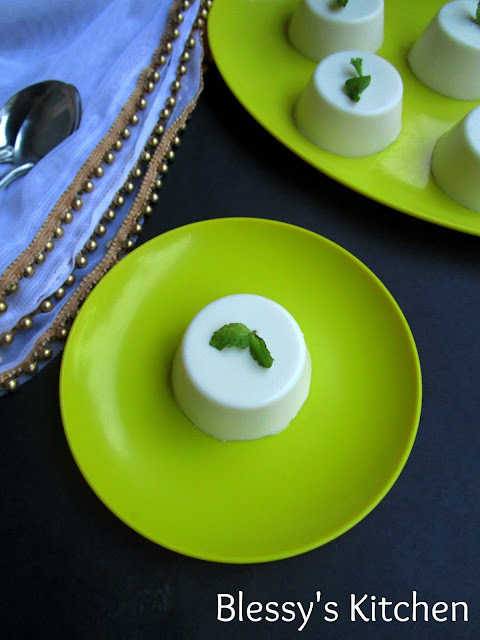 Some sweet puddings are set with gelatin or agar agar, corn starch and some are steamed. 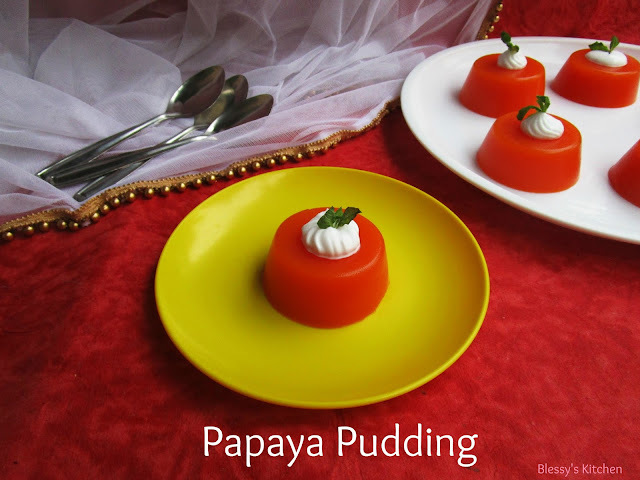 I've tried making puddings using the Agar Agar strands, have a look at it,Vanilla Pudding and Papaya Pudding. They are delicious and they get set very quickly! Give it a try and let me know how it turned out for you. I followed the Chocolate Pudding recipe from here.It's easy to make and yummy for your tummy. 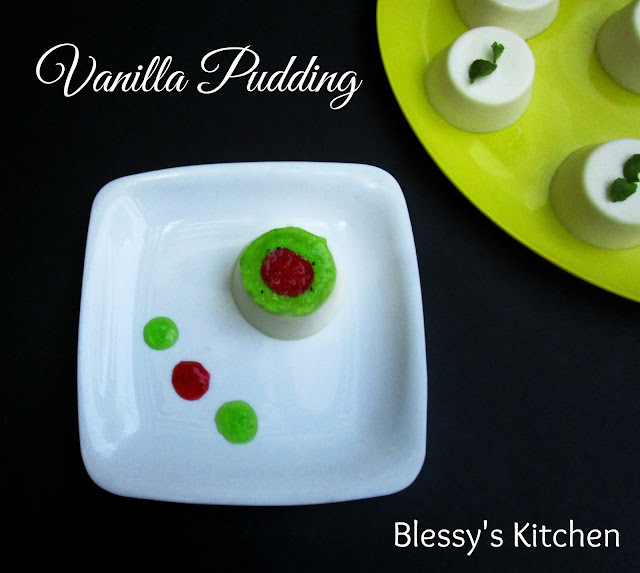 Make this Pudding and enjoy with your pals. pour it to the serving moulds and let it set. Serve chilled. 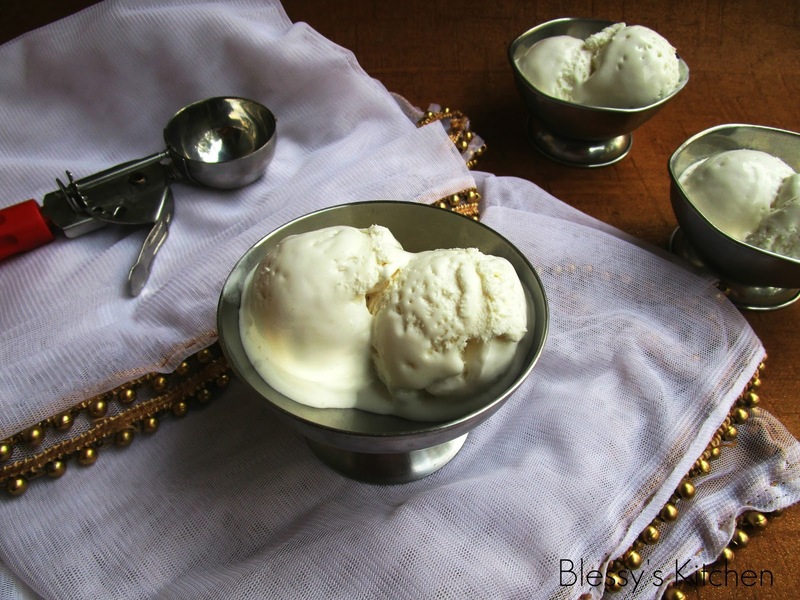 Serve Chilled with choice of nuts , fruits or whipped cream. 1. Cover the Puddings with the Plastic wrap to avoid the skin formation on the top. 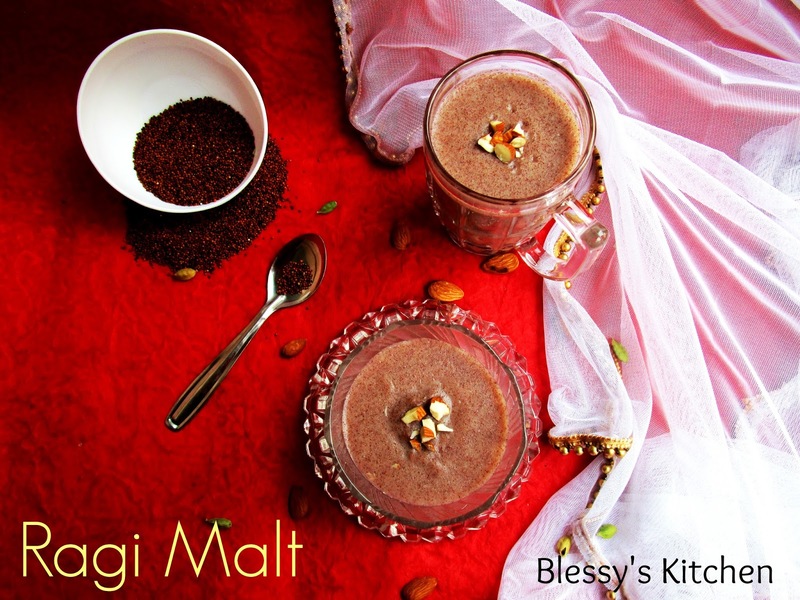 I've grown up having this Ragi Malt, I could say, its one of my favorite Healthy Indian drink! Especially if consumed in summer it cools the body and helps the body to relax. Ragi is good for health. It has many super benefits. It has less fat and more fiber, hence it can be on weight loss diet plans. Its good for diabetes, consumption of sugars and polished foods are the main reasons of having diabetes. 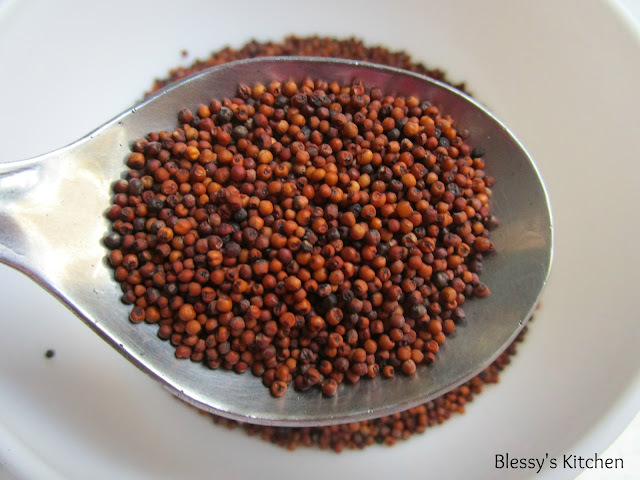 Ragi cereal is too small to be polished. So its good for diabetic patients. However I recommend diabetic patients to consume Ragi rice in regular intervals than the Ragi Malt. I don't know the science behind the reason, but Doctors say to have it in the solid way! 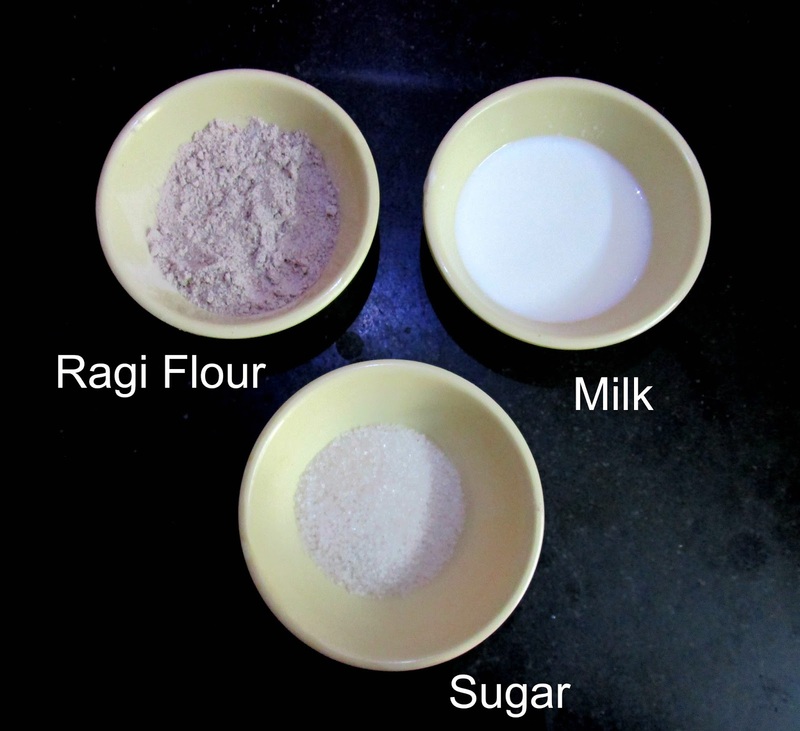 Ragi contains high amount of calcium. 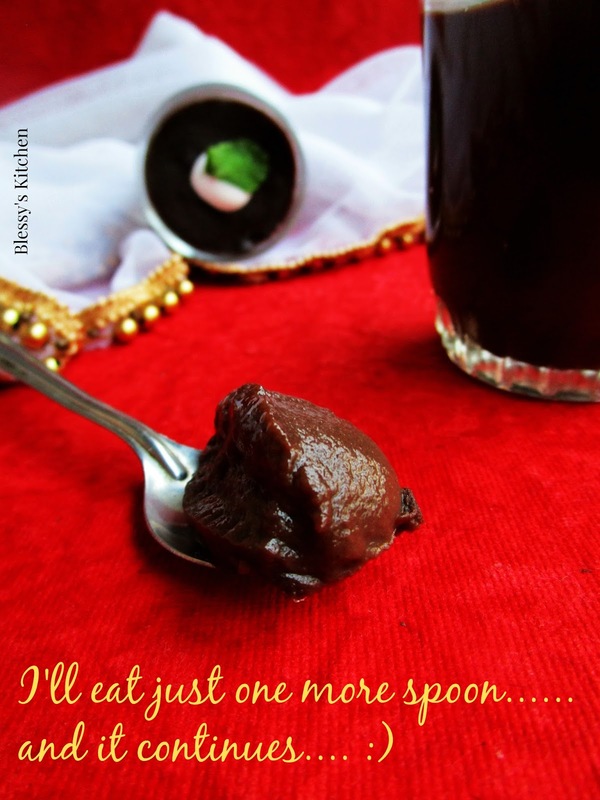 No other cereal contains the amount of calcium as Ragi does. 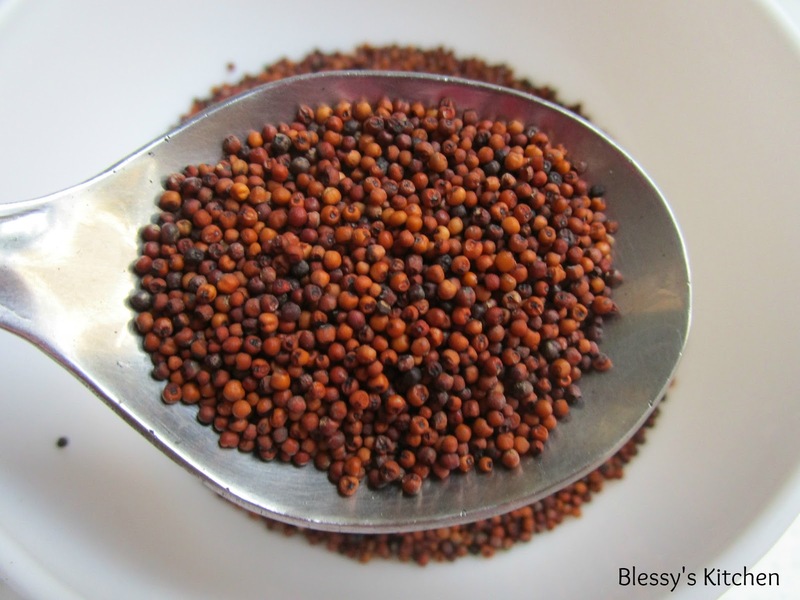 Ragi is a power packed cereal. It build immunity, kicks off the health problems when consumed regularly. Ragi malt can also served for babies. 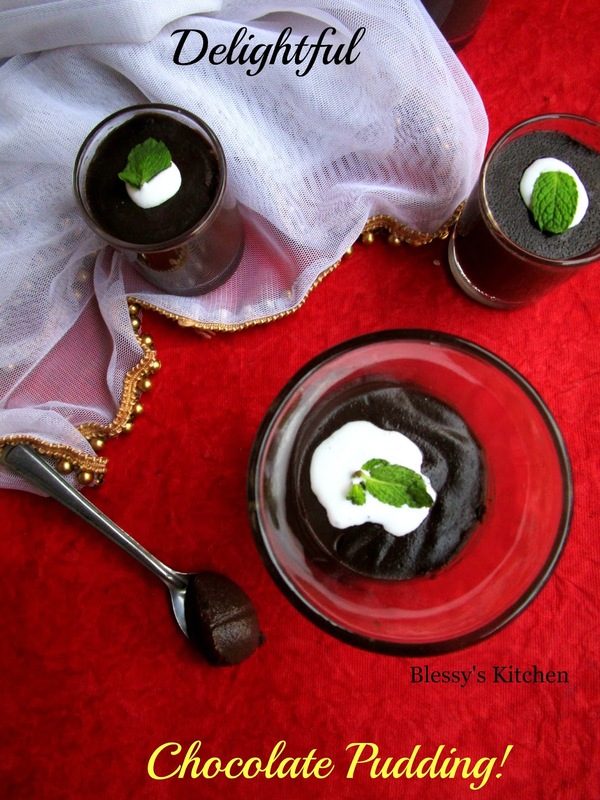 People who are gluten intolerant can have Ragi in their diet. The cooking method resembles the preparation of custard with the custard powder. 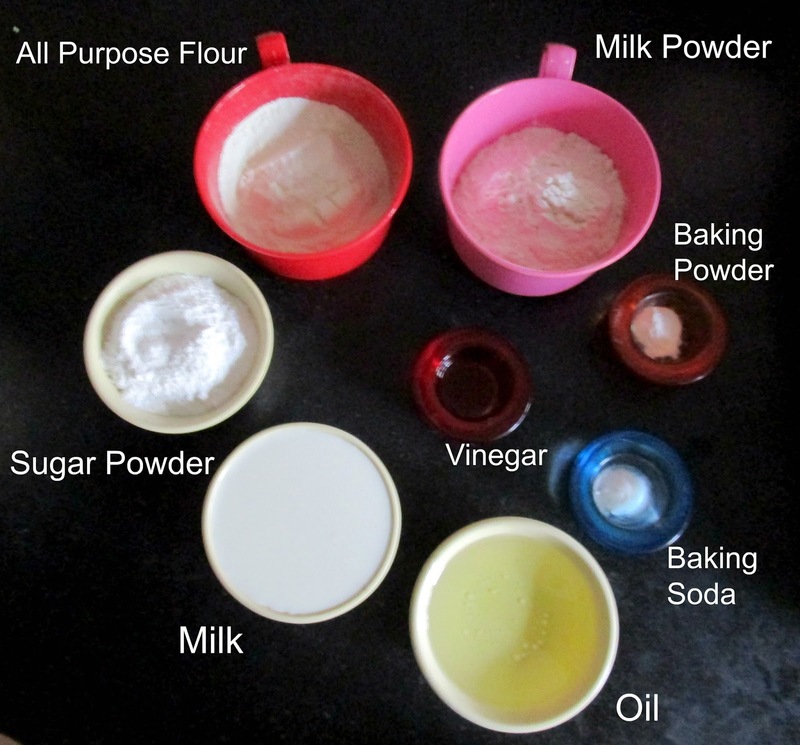 Instead of using custard powder, we are using Ragi flour and replacing the milk with water+milk. 1. Add around 50ml of water to the ragi flour and mix until all lumps are disappeared. 2. 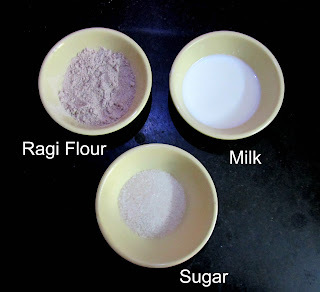 Bring the remaining water to a boil and add the ragi flour mix to the boiling water, add sugar and salt and milk. Cook until it slightly thickens (just like the custard consistency) and switch off the stove. 3. 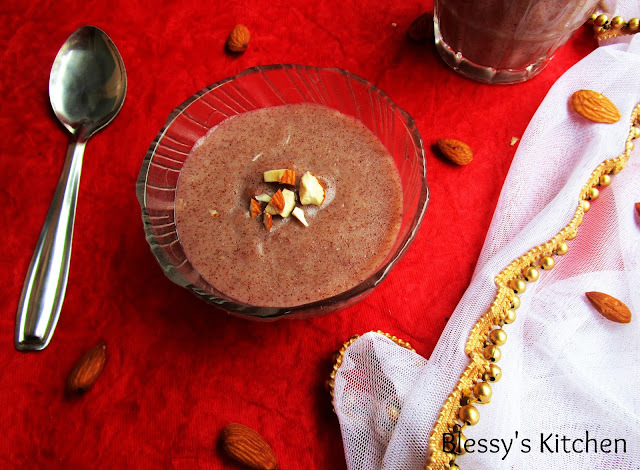 Now, your delicious Healthy Ragi Malt is ready ! Top it up with your choice of nuts and serve warm or chilled. 1. 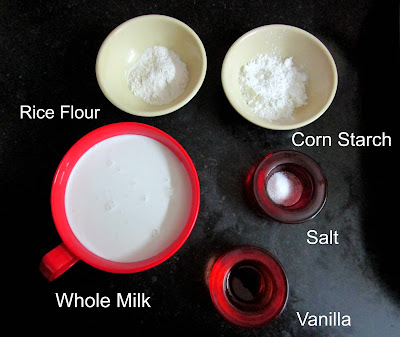 One could also make Ragi malt with buttermilk or curd. Once the Ragi malt is off the stove add the beaten curd or buttermilk to it. This is often consumed with the addition of salt, no sugar. 2. 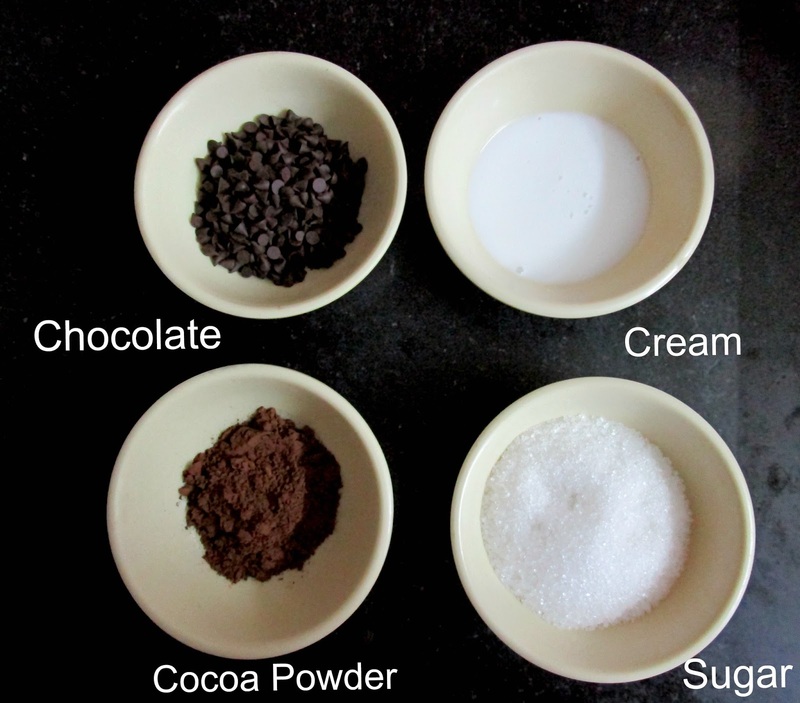 Once you add the Ragi Malt mixture to the boiling water, keep stirring continuously to avoid lumps. 3. One could add green cardamom/elaichi to flavour the Ragi Malt. 4. 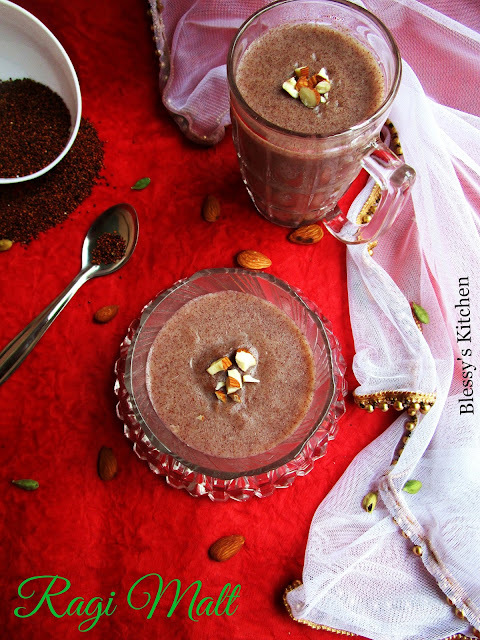 Ragi Malt can also be made with Sprouted Ragi Flour. 5. Sometimes, Ragi Malt may turn thick as it cools down. 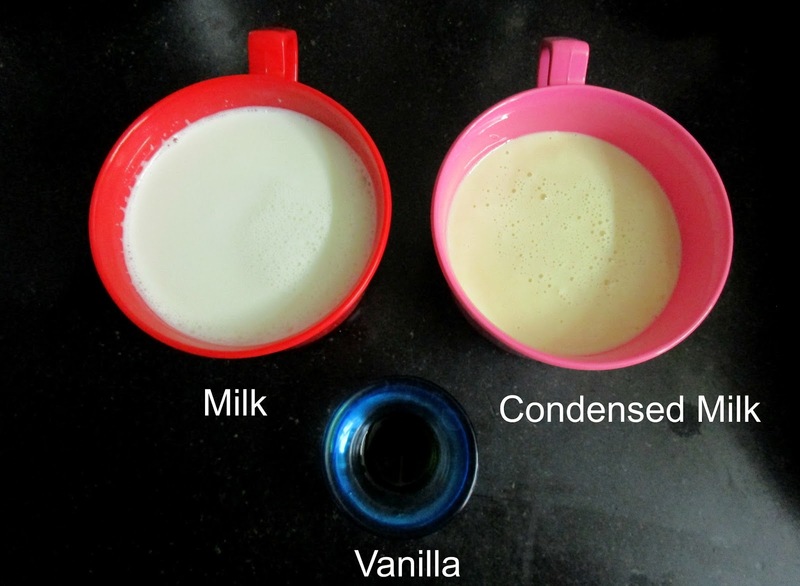 Dilute it with the required amount of milk and enjoy it. Papaya is the rich source of antioxidant nutrients. It provides good health. My dad consumes Papaya daily, its his favorite fruit. It lowers the Cholesterol, helps in weight loss, boosts up immunity, good for diabetics(recommended by doctors),good for digestion, prevents cancer etc etc. So what if I combine Angel of the fruits with Agar Agar! Agar agar is used in the preparation of medicines, it is also used to treat Diabetes, etc. So this pudding is a healthy one I can say! 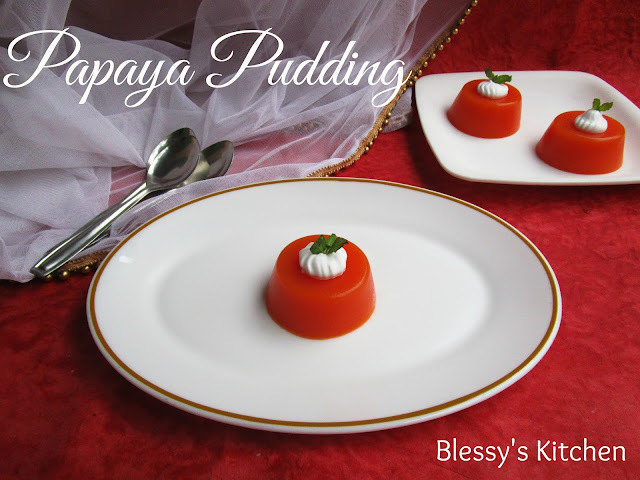 Diabetics can also consume this Papaya Pudding. 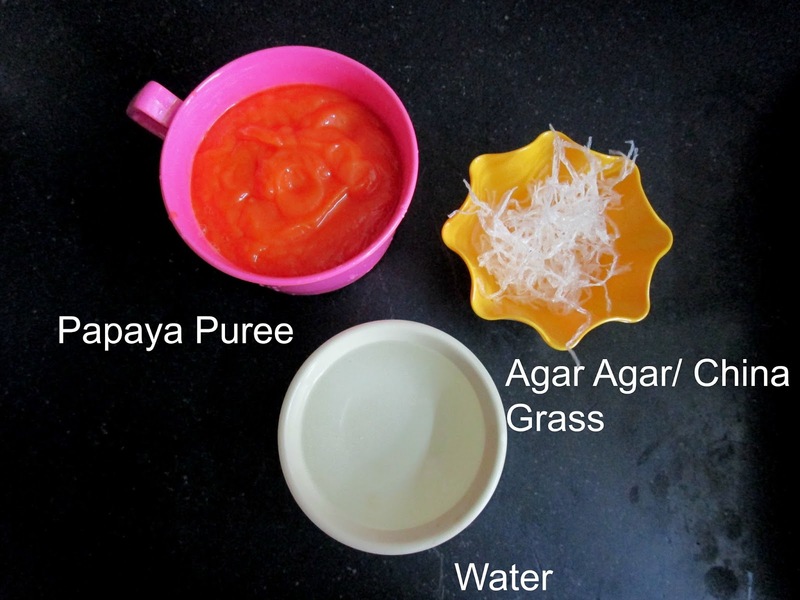 How I made my Papaya Puree? I Cut the Papaya in half, removed the seeds, whitish layer and the skin. Cut into cubes and blended into a Puree by adding few spoons of milk. 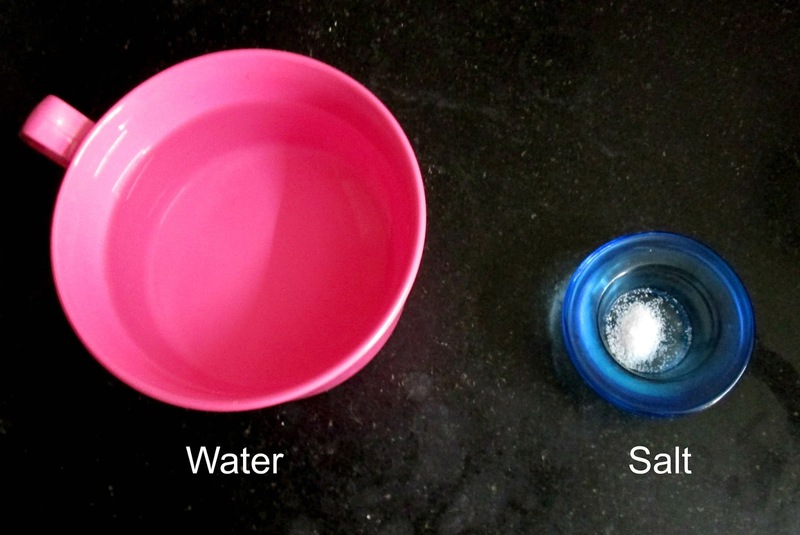 You could also add water. Now, check the taste. Add sugar if needed( I suggest you to add because the puree tastes slightly bitter)Now, Diabetics should add sugar free powder in this case. 1. 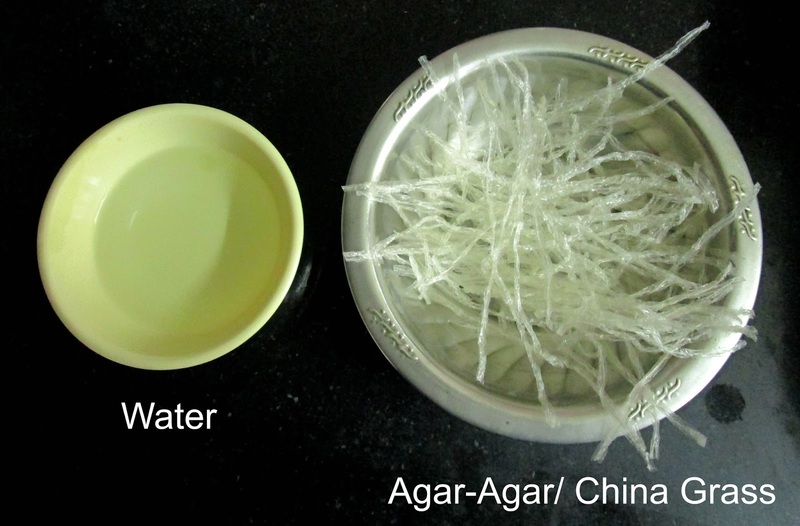 Soak the Agar Agar in water for 10 minutes. 2. After 10 minutes, melt the Agar Agar on the low flame until you see a clear liquid. 3.Add the melted Agar Agar to the Papaya Puree and Bring it to a boil. Whisk well and Switch off the flame. 4. Pour the Pudding mixture into the moulds and refrigerate until set. 5. Top it with whipped cream (optional). If still any bitter taste dominates, whipped cream on the top balances it. Refrigerate until set. Top it with whipped cream. 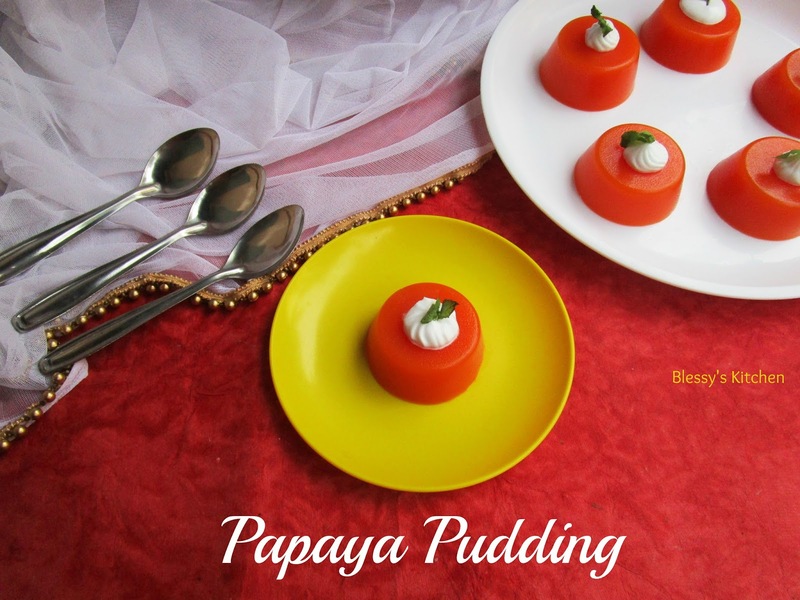 Enjoy this Healthy Papaya Pudding!! 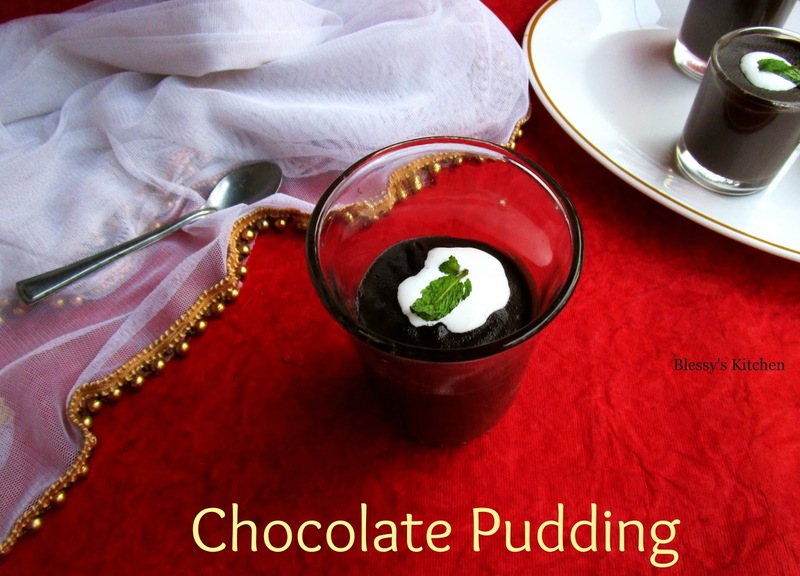 A scrumptious pudding is the best way to finish your meal. 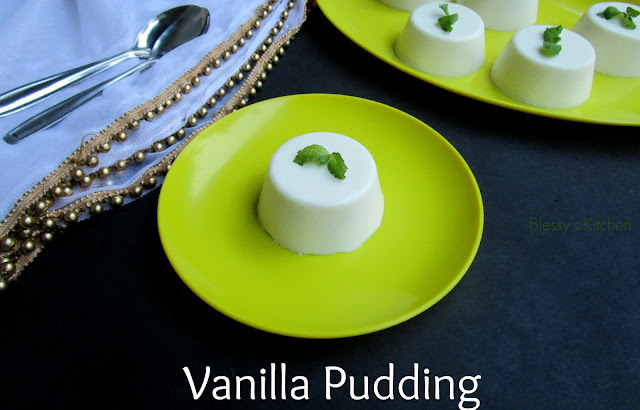 This pudding is easy to make and its delicious. The pudding sets very quickly,this will save your day! I made this pudding with my Homemade Condensed Milk. It came out perfect. 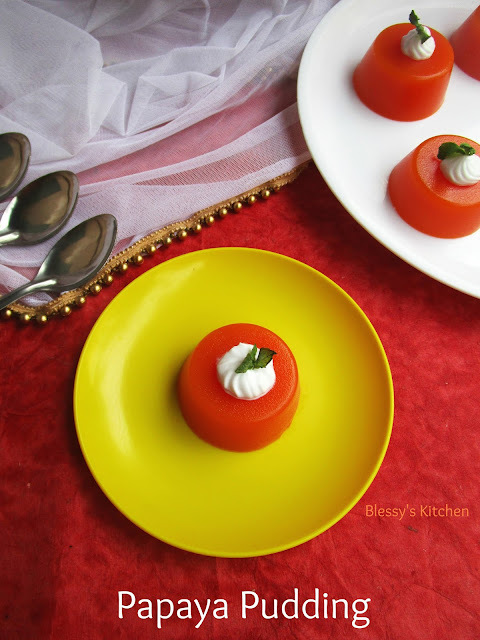 Do check the recipe,give it a try and let me know how it turned out for you. I also made Vanilla Ice cream, Leche Flan with the HCM. I'm in love with this Pudding! First, soak the china grass in water for about 10 minutes. Next, to a sauce pan add the milk, condensed milk, vanilla and bring to a boil. Switch off the flame and set it aside. Now, take the soaked Agar agar and melt it on the low heat until you see a clear liquid. Add the Agar agar liquid to the milk and whisk well. Strain this mixture and pour it into your desired moulds and refrigerate it until it gets set. For quick setting of the pudding, place it in the freezer for about 15 minutes. Refrigerate until set or freeze for about 15 minutes. If you're using Steel/aluminium moulds, better to grease on beforehand with the unflavored oil. Delicious Vanilla Pudding is Ready !! We all know the importance of Vegetables having consumed daily in our diet. But many of us don't like to have it in any form. I myself don't like Bottle gourd, Ridge gourd and Beets (which are actually good for our health) But when you juice it, its easy to consume. Imagine, having beets or carrots about 200 to 250 grams daily, is it easy? Nope!! But when you Juice them you can drink in one glass, it provides same health benefits and your body also does not have to work, to break down and digest. It's easy for your body to absorb all the nutrients and the enzymes. I want you to encourage to start juicing as it is the easiest way to squeeze nutrition into your diet. 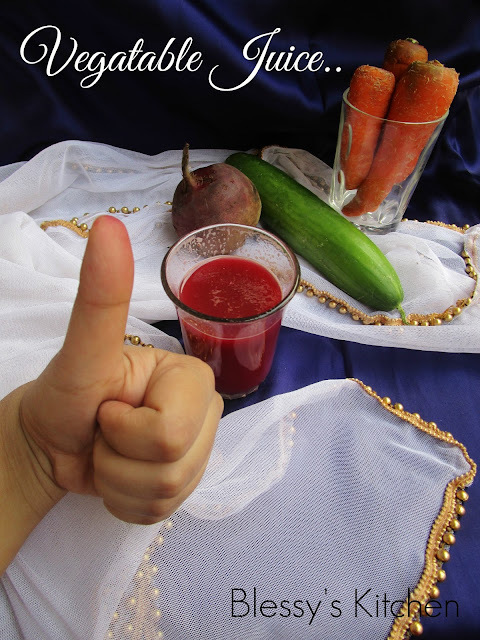 Juice the vegetables which is high in water content, roots like carrots and beets. You could flavor it with lemon juice and honey or salt,pepper and chaat masala. I drink it as it is! Some times it tastes bland when carrots and beets are not enough in the juice. Feel free to add raw organic honey. A sure road to Good Health is to Drink more and Eat Less. It's time for a Healthy Drink. Juice all the vegetables in the Juicer. If you don't have a juicer, blend them in the blender. 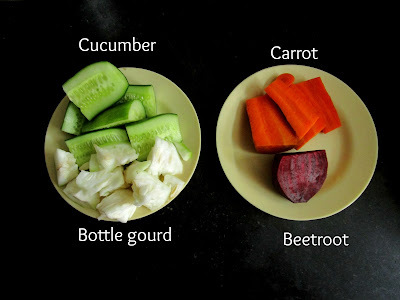 First add the vegetables which has high water content i.e, Cucumber and bottle gourd next carrots and beets. One could also use Ridge gourd, tomato. Add little water if needed. Filter the juice using a sieve and have it. To flavor juice you could add mint leaves, coriander, lemon or lime, honey and ginger. This is a small portion. Usually I have double of this or more. 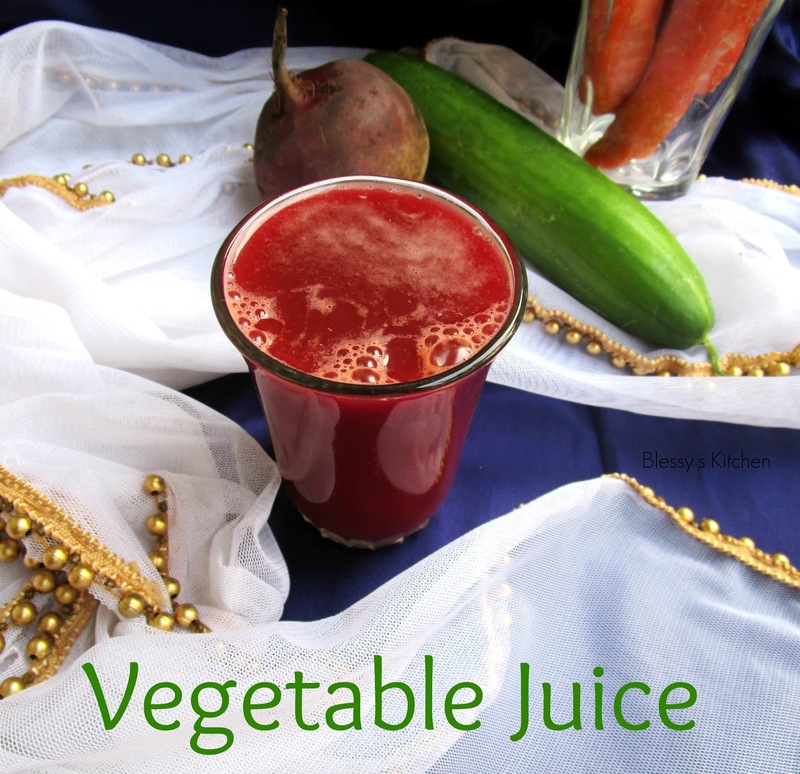 Drink this Juice in the morning on empty stomach. After around 30 minutes, you could have your breakfast if needed. 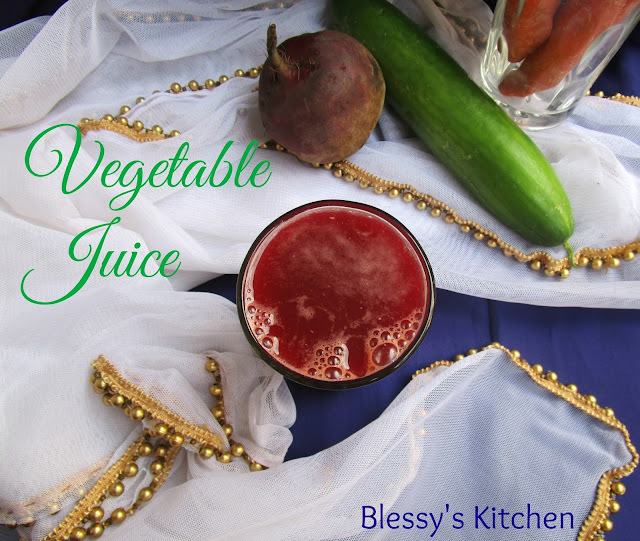 Those who want to be on liquid diet can drink this vegetable juice multiple times. 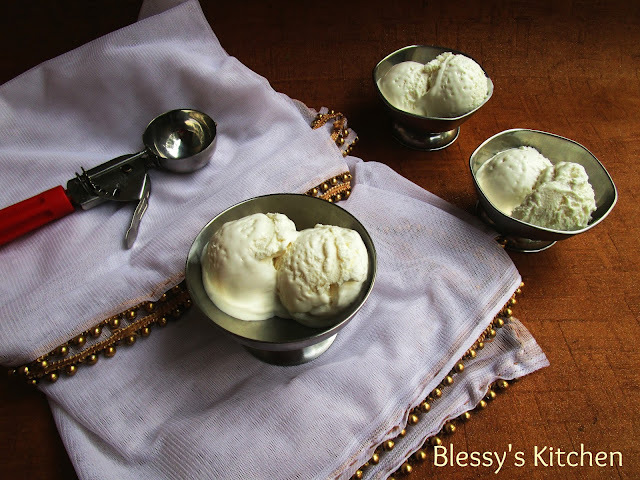 "You cannot buy happiness, but you can eat Ice cream and that's kind of the same thing"!! Frozen Treats are easy to make, delicious and you might get addicted to it, especially when it's summer there would be no barrier for you. But, since this is made with Heavy whipping cream, I recommend you to consume 1 to 2 scoops per day. If you're consuming more, exercise well, stay Fit. Add Whipping cream to a bowl and whip until it reaches soft peak stage. 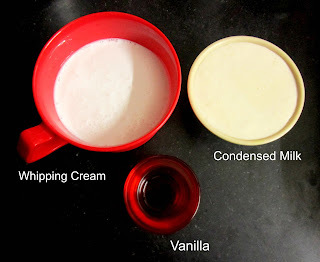 To that add the Condensed Milk and Vanilla. Mix well until everything gets subsumed well. This whole process is done under 10 minutes. Transfer this Ice cream to the Freezer safe container and Freeze for about 8 hours. I froze it for over night. 1. One could add fruit purees and create various flavours. 2. Add melted chocolate to make chocolate flavour. 3. 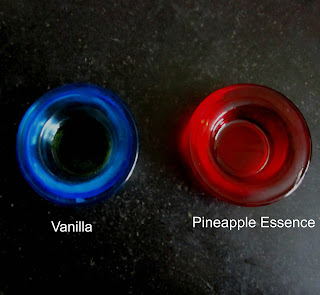 Add tutti frutti to make tutti frutti flavor. 4. 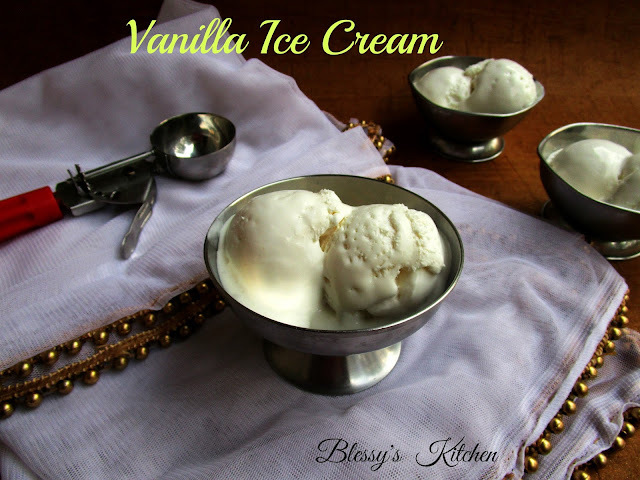 One can also add chocolate chips to the Vanilla Ice cream.